Progressive Charlestown: Anti-science starting to fade? Over the course of recent years, polls that examine American attitudes on global warming suggest that climate denial may be dying. It would appear that Americans have gone through the five stages in what has been called the cycle of climate acceptance. This is an adaptation of Elisabeth Kübler-Ross’ seminal work, “On Death and Dying.” The first step is denial, followed by anger, depression, bargaining and finally acceptance. While many of these stages overlap or co-occur, the general trend from denial to acceptance appears to be borne out by polling data. After the recession of 2008, Americans were in no mood to consider let alone embrace the veracity of climate science. They were preoccupied with their short term economic well-being and the cataclysmic implications of climate change were simply too much to consider. In short, they were in a total state of denial. This is the conclusion of research by Scruggs and Benegal. They claim that since 2008, “the public’s concern about climate change has declined dramatically.” These authors cited research by the Woods Institute for the Environment, which showed that belief in climate change was stopped or reversed after the recession. Angry vitriolic obstructionism has been one of the defining features of the Republican Party. This anger was most vehemently personified by the angry arch-conservatives known as the Tea Party. However, even the mainstream of the Republican Party began to organize coordinated attacks on climate science and they further confused Americans with rants chalked full of misinformation. Thanks in large measure to their war on science, belief in climate change remained static or declined among the general population. In 2013, the mood in the US turned to apathy. Americans ignored the issue or dismissed it as a conspiracy theory. 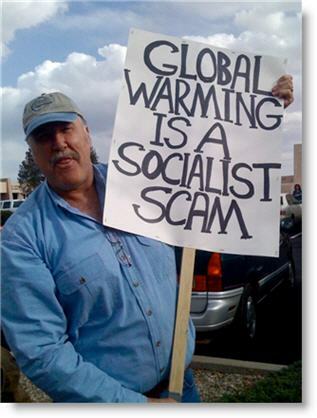 According to a 2013 Public Policy Poll, three out of every eight (37 percent) registered voters in the US considered global warming a hoax. Those who dismissed climate change as a hoax were far more likely to support the Republican Party. While 58 percent of Republicans said that it was a hoax, only 11 percent of Democrats agreed. Nonetheless, Americans began to move beyond the partisan politics of the GOP. A 2014 Pew Research Center Poll indicated that 71 percent of Americans thought the government should do whatever it takes to protect the environment. An April 2014 poll revealed that Americans were supportive of emissions limits for coal fired power plants. This last point was corroborated by a number of subsequent polls including one from the Washington Post and ABC News, and another from the Wall Street Journal and NBC News.